The Melbourne Storm are an Australian professional rugby league football club based in the city of Melbourne , Victoria . They have competed in every season of the National Rugby League (NRL) Premiership since its inception in 1998 and are the first fully-professional rugby league team based in the Australian rules football-dominated state of Victoria. The Storm are the current premiers of the NRL. As of October 2009, they were ranked the most popular sporting team in Melbourne by a national Roy Morgan Poll. Melbourne won their first premiership in 1999, only their second season of competition. The club has qualified for all but two finals series since their inception into the NRL, winning the minor premiership three times in a row from 2006-2008, and contesting each grand final from 2006-2009, winning in 2007 and 2009. This makes them one of the NRL's most successful clubs in the premiership today, earning them the title of NRL Team of the Decade for the 2000's. Their coach Craig Bellamy is the incumbent New South Wales State of Origin coach and their captain Cameron Smith has captained the Australian national team. The Storm formerly played their home games at Olympic Park Stadium . Plans are in place for the team to move to the new Melbourne Rectangular Stadium upon its completion. Originally a Super League initiative, the Melbourne club is currently 100% owned and operated by News Limited. In 1996, the Australian Rugby League (ARL) decided to establish a Melbourne based team due to the high attendances at recent State of Origin matches. But in May 1997, Super League boss John Ribot pushed for a Melbourne based club for the Super League competition, which was the rival against the ARL (Australian Rugby League) competition. Former Brisbane Broncos centre Chris Johns became the CEO of the club and Ribot stepped down from the head of Super League to set up the club. In September 1997, Melbourne announced that Chris Anderson would be their foundation coach, and then Super League announced that the new team would be named the Melbourne Storm. The Melbourne club then went forward with signing players, mainly from former Super League clubs Perth Reds and Hunter Mariners. Some of these players included Robbie Ross, Glenn Lazarus, Brett Kimmorley and Scott Hill. With the Super League and ARL joining into one competition for the 1998 season, the Melbourne team became part of the National Rugby League (NRL). The Melbourne Storm club was unveiled at a function in the Hyatt in February, 1998. In their first ever game, they defeated Illawarra, with Glenn Lazarus as their inaugural captain. Melbourne, in a complete shock to the rest of the competition, won their first four games, before losing to Auckland. They went on to make the finals, but were defeated by the eventual premiers, the Brisbane Broncos. In January 1999, CEO John Ribot negotiated a deal that saw Melbourne Storm games televised in China every weekend. The club won eight of their first eleven games of the 1999 NRL season, and went on to make the finals in third position on the premiership ladder. The team was beaten convincingly 34–10 in the quarter final by St. George Illawarra, but came from behind in both the semi final and preliminary final to make the grand final. Melbourne faced St. George Illawarra in the 1999 grand final, with St. George Illawarra favourites due to their comfortable defeat of Melbourne only three weeks earlier. When St. George Illawarra were ahead 14–0 at half time, Melbourne seemed down and out, but two tries to Melbourne put the score at 18–14 in favour of St. George Illawarra with 15 minute remaining. With three minutes remaining, Melbourne winger Craig Smith was knocked out by a high tackle which caused him to lose the ball over the try line. In a historic video refereeing decision, a penalty try was awarded and Melbourne's Matt Geyer kicked the goal that won Melbourne the 1999 Grand final. Melbourne won the 1999 Australia Sport Award for domestic team of the year. The 2000's proved to be even more fruitful for the Melbourne Storm, thanks to their undeniable sheer dominance in the latter part of the decade. Season 2000 saw Melbourne consistently win after initially losing their first four games of the season. They made the finals (finishing 6th), but were eventually knocked out by Newcastle in the quarter-finals. Between 2001 and 2002, the Melbourne club performed poorly. Cracks were starting to appear between Johns, Ribot and Anderson throughout the period, with Anderson quitting as coach mid-2001, replaced by Mark Murray. The Melbourne club failed to make the finals in 2001. Johns left the club as CEO at the end of 2002 and coach Murray was sacked due to Melbourne's poor form, with the club missing the finals for the second year in a row. Craig Bellamy was announced as the new coach of Melbourne for 2003. In addition to a new captain in Kiwi international Stephen Kearney, the strict coaching of Craig "Bellyache" Bellamy would see the Melbourne Storm get back on track from the previous lean years. Between 2003 and 2005, Melbourne consistently made the finals, but lost games in the semi finals that prevented them from reaching the grand final. On 17 July 2004, during round 19 of the 2004 NRL season, Danny Williams king-hit Wests Tigers' player Mark O'Neill. Storm players celebrating their premiership win in 2007.
defended the incident, using four medical experts to argue on his behalf that he was suffering post-traumatic amnesia when the incident occurred, which he claims was the result of a high tackle by O'Neill just prior to the incident. Despite Williams' claim, he was suspended for 18 weeks by the NRL judiciary. After the decision, Williams stated that he was "obviously disappointed with the outcome". It was the longest suspension in Australian rugby league since Steve Linnane was suspended for twenty weeks for eye-gouging in 1987. In 2005, Storm coach Craig Bellamy, in his third season as an NRL coach, gained representative honours when he was selected to start coaching the Country Origin. Season 2006 saw a new-look Storm, with the retirement of Captain Robbie Keanrs, the mergence of talented rookie Halfback Cooper Cronk taking the reigns from longtime number 7 Matt Orford, and the recruitment of hard-man Michael Crocker. Contrary to expectation, 2006 was a standout year for the Melbourne team, winning their first minor premiership following a resoundingly dominant Home and Away Season, including a club record 11 game streak. Melbourne only lost four games in the season, making them outright leaders by four wins. They went on to win their two finals matches, and were subsequently favourites in the 2006 NRL Grand Final. The Storm however lost 15-8 the to the Brisbane Broncos, in a match where controversial refereeing decisions against Melbourne caused much media coverage. In 2007 the Storm avenged for their heartbreaking end to the 2006 campaign by playing as they did in 2006: once again dominating the competition, and finishing on top after 25 rounds. In the first week of the NRL finals, Melbourne played Brisbane, in which Melbourne won 40-0, securing a spot in a preliminary final. In the preliminary final, Melbourne played Parramatta in a game that was tied 10-10 at half time, before a superb second half by Melbourne resulted in the final score of 26-10. The win was particularly satisfying for Melbourne fans, coming soon after Parramatta CEO Denis Fitzgerald said that rugby league should not be promoted in Melbourne. This game drew a larger crowd than chief rival Manly's preliminary final. Melbourne thrashed Manly 34-8 in the 2007 NRL Grand Final. Greg Inglis won the coverted Clive Churchill Medal for best on ground, and an emphatic victory. In Season 2008, Melbourne won their third minor premiership after the 26 rounds of regular competition. Despite becoming the first minor premiers since the McIntyre Final Eight System was introduced to lose their opening finals game 15-18 to the New Zealand Warriors, they then defeated the Brisbane Broncos 16-14, scoring in the last minute of their semi final. Bellamy was fined $50,000 for making scathing remarks regarding the NRL's decision to suspend Cameron Smith over a controversial "grapple tackle" on Brisbane's Sam Thaiday. Bellamy wrongly claimed that the administration was corrupt and that bookkeepers already knew that Smith would be denied the opportunity to play for the rest of the season. Along with Melbourne's CEO, Bellamy questioned the NRL's integrity in their opting to sideline Smith and not others who were guilty of committing similar tackles. In their qualifying final, Melbourne convincingly beat the Cronulla Sharks 28-0. But in their second successive grand final appearance against the Manly Sea Eagles, Manly belted Melbourne 40-0 in the biggest grand final margin of all time. At the Dally M Awards for season 2008, Melbourne picked up 6 awards, with 3 to Greg Inglis, and 1 for each of Billy Slater, Cameron Smith and Israel Folau. Billy Slater and Cameron Smith finished 2 points behind Manly's Matt Orford for the Dally M Medal with 22 points each. Billy Slater was awarded the international player of the year Golden boot award for 2008, following on from Cameron Smith in 2007, which is awarded by an expert panel of rugby league former players and media commentators around the world and is considered recognition for the year's greatest player. Following the 40-0 defeat, many believed the Storm dynasty of the late-2000's was over, and that Season 2009 would be a year of rebuilding. After a poor year on the field by the Storm's lofty standards, Melbourne finished 4th on the ladder after the home and away season, entering the finals clear underdogs. In Week One of the finals, the Storm romped 2008 Premiers Manly 40-12 in the qualifying final, ending their hopes of back-to-back premierships, and laying to bed some of the demons of the 2008 Grand Final. This was followed a fortnight later by a 40-10 thrashing of fierce rivals and 2006 Premiers Brisbane in the preliminary final, ensuring the Storm qualified for their fourth straight grand final (the first since Parramatta from 1981-1984). The Preliminary Final was also a monumental game for the Storm as it saw favourite son Billy Slater score his 100th career try and Cameron Smith became Storm's highest ever point scorer, surpassing Matt Orford's record of 877. The Melbourne Storm then capped off a truly brilliant late-season resurgance to end a rampaging Parramatta side in front of a parochial strong crowed at ANZ Stadium. Parramatta, coming off 10 wins from 11 games, led by the in-form young superstar Jarryd Hayne proved to be no match for the Storm's typical gameplan of grinding football, ensuring a defeat of the razzle-dazzle offload fuelled football of Parramatta. Despite the Storm leading Parramatta at one stage by 16 points, the Eels fought back in a late charge to bring the margin back to 7, with the Storm sealing a 23-16 win with a late Greg Inglis field goal. For his fantastic efforts, Fullback Billy Slater was awarded the 2009 Clive Churchill Medal for Man of the Match. Following the victory in 2009, the Melbourne Storm have been earned the title the NRL Team of the Decade for the 2000's. The Storm's first match of the new decade will be the 2010 World Club Challenge against equally dominant English side, the Leeds Rhinos. For the 2010 NRL season they will play their home games at the newly-built Melbourne Rectangular Stadium . Originally, the club favoured the name Melbourne Mavericks with a gunslinger logo holding a fistful of aces. The club officials were all set to go with this until News Limited's Lachlan Murdoch told them to go with something else because the Mavericks sounded too American. Trams and Flying Foxes were also some ideas that came up. However co-CEOs Chris Johns and John Ribot decided to go with the themes lightning, power and storm. The club then became known as the Melbourne Storm. The Storm was always going to go with the colours of their state, Victoria . These were navy blue with a white 'V'. But club consultant Peter McWhirter, from JAG fashion house, suggested that they should also have purple and gold to make their merchandise more attractive. Gold still appears on the logo, but has now been removed from the Storm's home guernsey, where the colours now consist of navy blue, purple, white and silver. St George Illawarra Dragons . The Storm narrowly beat them in their first grand final in 1999, with a late penalty try putting the Storm in front. The following year Anthony Mundine declared that the Storm were not "worthy premiers" in the run up to their round 5 rematch. The Storm responded by beating the Dragons 70-10. In Round 18 the Dragons added to the rivalry by defeating the Storm 50-4. In 2006 the Storm defeated St. George Illawarra in the Preliminary Final. On 21 July 2008, Storm won a match at Olympic Park 26-0, that was highlighted by several ugly brawls. In 2009, the Storm beat them in the Round 1 home game 17-16 with a field goal in Golden Point (the second time the two teams were drawn at fulltime). Brisbane Broncos. The Melbourne Storm has a strong rivalry with Brisbane , built in large part on the large number of finals games played between the teams, including one final in each year from 2004 to 2009. The move of Brisbane coach Craig Bellamy to Melbourne has also been attributed to fueling the rivalry. Melbourne captain Cameron Smith commented on the rivalry prior to their 2009 Preliminary Final at Etihad Stadium. The Brisbane Broncos defeated the Storm 15-8, under controversial circumstances, in the 2006 NRL Grand Final. The Storm sought revenge through a 40-0 thrashing in the 2007 Qualifying Final at Olympic Park Stadium . The 2008 Semi-Final at Suncorp Stadium , one of the most memorable games of the decade, ended with Melbourne dramatically winning 16-14 with a try on the final play of the game. In 2009 Brisbane were again beaten by eventual premiers Melbourne, this time 40-10 at Etihad Stadium, catapulting the Storm to their 4th consectutive Grand Final Appearance. Manly Sea Eagles, whom the Storm belted 34-8 in the 2007 Grand Final but lost to in the 2008 re-match in a 0-40 loss. To add the the rivalry, Melbourne decimated Manly 40-12 in the opening final of the 2009 finals series, ending their bid to be back-to-back premiers. Melbourne have played the vast majority of their home matches at the city's Olympic Park Stadium , affectionately coined "The Graveyard" by fans due to the incredible 77.2% winning percentage there. It was here that the club played their inaugural home match in the fourth round of the 1998 season on 3 April 1998, having come off the back of three successive away victories. In front of what remains the club's record Olympic Park attendance of 20,522, the team recorded a 26–16 victory over the North Sydney Bears. The team remained at the ground until the end of the 2000 season. In the 2000 season they attracted an average home attendance of 14,622 still their highest season average. Following steady attendance increases over the three years, it was decided to move home games to the much larger Docklands Stadium for the following year. However, with the team ending up missing the finals, crowd numbers declined and it was decided to move the team back to Olympic Park. Attendances bottomed out to an average of 8,886 per home game in 2004, but they have steadily risen each year back to an average of 12,474 per home game for the 2008 season. A home attendance record of 33,427 was set in 2007 for the Preliminary Final against Parramatta, at Telstra Dome . 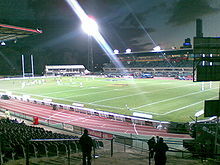 The Storm played their last game at Olympic Park in round 25, 29th of August 2009, with a 36-4 thrashing of the Sydney Roosters. For the 2010 Telstra NRL Premiership season, the Storm's first three home games (rounds four, six and seven) are expected to be played at Etihad Stadium . The club will play its first game at the new Melbourne Rectangular Stadium in round nine (May 9 2010) against the Brisbane Broncos. The club had anticipated playing its first game at the new ground in round four against the St George Illawarra Dragons, however, a delay in construction required the opening to be pushed back several weeks. Melbourne's highest ever point scorer is Cameron Smith (882 - 27 tries, 387 goals). Matt Geyer has the most tries in the club's history with 113 tries, followed by current player Billy Slater (102) and Storm legend Marcus Bai (70). Matt Geyer holds the record for most points scored in a season, with 242 (20 tries, 81 goals) in the 1999 premiership season. .In his rookie season, former player Israel Folau broke the Storm's club record of most tries in a season by crossing over the line 21 times in 2007, and became the youngest ever player for Australia, at 17 years of age. Melbourne's highest ever victory was the 64–0 against Wests Tigers on 5 July 2001. The most points they have ever scored is 70, when they defeated the St. George Illawarra Dragons 70–10 on 3 March 2000. However, their biggest defeat was by 46 points to both the Bulldogs (50-4 on 10 August 2003) and to St. George Illawarra (50-4 on 4 June 2000). Over the 12 years that Melbourne have participated in the National Rugby League, they have the following Win-Loss record (as of Finals week 1, 2009). Although other players may play for the Melbourne Storm during the year, all NRL clubs are required to select a top 25 First Grade squad at the beginning of the season. Below is a list of around 25 players ranked by their cap number at the Melbourne Storm. Parramatta Eels halback Brett Finch was granted an early release from his club after they told him he had no future there. He then signed a short-term deal to play for the Storm in 2009, as part of the second-tier salary cap. As part of their 10 year celebrations in 2007, Melbourne Storm released a team of the decade. The 17 man team was selected by former assistant coach Greg Brentnall, foundation CEO John Ribot, Daily Telegraph journalist Steve Mascord and board member Frank Stanton. Rotating captains policy was in place from 2006 until Cameron Smith was made sole captain in mid-2007. The Melbourne Storm's current head coach is Craig Bellamy. His assistant coach is New Zealand national team head coach Stephen Kearney. The Melbourne Storm's supporter base grew from almost 500,000 in 2004 to almost 800,000 in 2009, making them the fourth best supported NRL team.